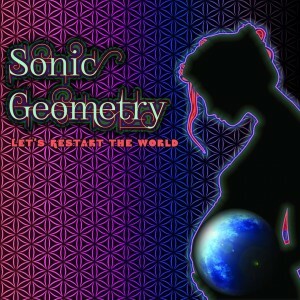 Today marks the release of Sonic Geometry’s Lets Restart the World album out on beatport! I first discovered the fabulous Andy Beyer aka Sonic Geometry after downloading a free mix put out by my favorite hometown label Gravitas Recordings. Andy’s fresh song “Rollin” was featured on the “Virtus In Sonus II” mix CD released last July. I loved this mix of artist and songs so much that it was featured on Thispicissick.com that very day in July. Two days later, it was Fourth of July and I was celebrating with this mix in the background as I danced with elk in Estes Park, CO with my boyfriend Jellyfish aka Steven Tillman. Interestingly enough, “Virtus In Sonus” translated means “Power in Sound” or “Virtue through Sound,” looking back, what a powerful day in my life that was! Little does Andy know, Jellyfish and I now call July 4th our anniversary, and his music has been there with us from the very start of our beautiful relationship. I have had the true pleasure of watching Andy perform live twice since that magical day in the mountains last July. Neither time was anything short of superb. First, a headlining spot behind just a laptop armed with a guitar at 303 Vodka in Boulder for New Basics Wednesdays. Second, opening for Freddy Todd at Casselmens in Denver. After listening, listening, and listening a little more, one truth emerges: Andy Beyer’s production and live performance skills shine bright no matter what the occasion or audience! His new album “Lets Restart The World” came out today and I had the pleasure of receiving an exclusive preview. The magic I feel when listening to this fabulous Album resonates with me long after the songs have ended. The title track “Lets Restart The World” is what I would call ideal meditational music. A gorgeous chime entrance to the title track swiftly gives way to a beautiful guitar intro. Quickly, I feel as though I am pulling the beaded curtains back and about to swim my way through a positive vibrational vortex. Then the beat quickens and the jam of Andy with his guitar washes over me. I find my feet and head, both are rocking to the beat. The Second track “Sacred” is much different but equally as spiritual. A down tempo song featuring soothing guitar and meditational vocals that put me in a very positive mind state. After previewing these tracks I am very excited about what is to come from Sonic Geometry! His music makes you want to dance. His style makes you want to mediate. The incorporation of this energy at a live show is THE BEST! I truly believe that Sonic Geometry’s meditational musical magic can RESTART THE WORLD! Great work Andy! This is something many ears will surely enjoy!